One very cold winter while living in China, a few friends and I decided to take a trip to Harbin (because we weren’t already cold enough! ), one of the largest cities in northeast China, near the Russian border. Harbin is known for its Russian history, bitterly cold winters from the wind blowing down from Siberia, and the lighted ice sculptures throughout the city for the winter Ice Festival. With the constant below freezing temperatures, the sculptures are frozen all winter long. Interestingly, the city name comes from a word originally meaning “a place to dry fishing nets”, which makes me think of somewhere warm and sunny, not cold and snowy, but Harbin does experience a warm summer as well. Our hotel was so cold, that we ended up pushing our beds together and shared all the blankets just to try to stay warm at night! We also spied a few bugs in that room, but tried not to let it keep us awake. I’ve never worn so many layers of clothing at one time as what I wore there – 2-3 pairs of socks inside my boots, long underwear, then jeans, then another pair of pants, 7-8 shirts, not to mention a coat, multiple pairs of gloves, hat, and a scarf wrapped around every part of my face except my eyes. Every breath I took froze inside my scarf, leaving little ice crystals against my lips. We couldn’t walk around outside for longer than a couple of hours at a time, before we had to find somewhere indoors to warm up. Just getting dressed to go outside was quite a production. At the Ice Festival, we tried to climb an ice wall with a rope (impossible), slid down ice slides, went sledding down a massive hill, wandered through all the sculptures, ate skewers of frozen fruit and fried bread, and even rode a camel! He was very hairy and smelly, by the way, but at least he was a warm seat to sit on… We visited Saint Sophia Cathedral, a Russian orthodox church that was converted into a museum and walked the streets as much as we could tolerate the cold, to see as much of the unique blend of Russian, European and Chinese architecture as we could. Besides the Ice Festival, Harbin is also home to the largest natural reserve for the endangered Siberian tigers, the Siberian Tiger Park. In addition to the tigers, there are also lions, which live peacefully with the tigers, lynx, leopards and pumas. It’s a unique sort of zoo, with the animals roaming freely through the expanse of the land, while visitors can ride in armored vans through the park, and even pay to watch live animals fed to the tigers. Watching something like a live cow being fed to tigers was more than I would have been able to handle, so we opted for a chicken, and hoped it would be a quick and painless meal. One of the employees quickly tossed the chicken out the window and yanked his arm back inside, just as the tiger leaped up on top of the van to devour his snack, basically just a chicken McNugget to him! However, when it’s cold and snowy outside, people seem more apt to want to add a splash of alcohol to just about everything, and I can’t say I disagree with that, since I’m tempted to pour bourbon into every dish I make this time of year. I made pork chops for dinner the other night, glazed with a bourbon and soy sauce glaze, then topped with leftover cranberry orange compote, which was so full of holiday flavor. Lately I’ve been dreaming of a rummy, chocolaty cake, ironically just when someone e-mailed me to ask if I had a recipe for rum cake, but I hadn’t had a chance to make it yet. 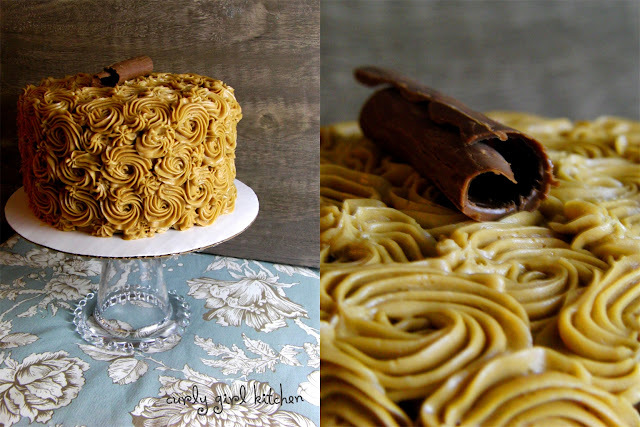 When I wrote this recipe, I had originally intended to bake it in a bundt pan, then drizzle it with a cappuccino glaze, having actually adapted it from my pound cake recipe. I also had every intention of using Hershey’s Special Dark cocoa, but forgot to buy any, so instead of calling it a “Midnight Mocha Rum Cake” I am calling it just “Mocha Rum Cake”. I do think, though, that the dark cocoa would be incredible, since I’m a big fan of dark, bittersweet chocolate. 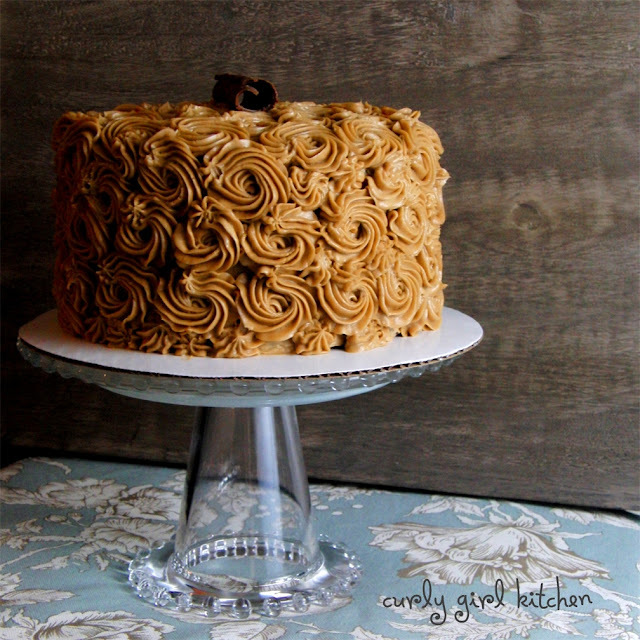 I don’t really remember why I decided to bake it as a layer cake instead of a bundt, but that’s what I did, and it was every bit as perfect. (And while I haven’t actually tried this recipe in a bundt pan, I fully believe it would work beautifully.) It’s not a light and airy cake, like my standard dark chocolate cake recipe, instead it’s more dense like a pound cake, moist and almost fudgy in texture, which is why it should also bake well in a bundt pan. I frosted the cake with a rich cappuccino buttercream, flavored with plenty of rum and one of my favorite ingredients, Espresso Powder, to give it an intense coffee flavor. I frosted the cake simply, leaving the sides open and just garnishing it with a few colored sprinkles on top. After we sampled a few bites of the cake, I wrapped up the rest for us to take to work; midmorning, after I’d watched one of my own coworkers go back for his third piece, Jamie texted me that one of his coworkers fell in love with the cake – referring to it as “Espresso Cake” – so much so that he wanted one of these for Thanksgiving instead of pie! I only felt slightly panicked, not at the thought of going home and baking a cake that night, but because I had used up the last of my espresso powder the day before, and hadn’t had the chance to buy more. I promised I would have the cake ready, though, and after work, made a beeline for Williams Sonoma, keeping my fingers crossed that they would have the powder in stock. I breathed a little sigh of relief at the sight of those glass jars on the shelf and bought two, as long as I was already there. 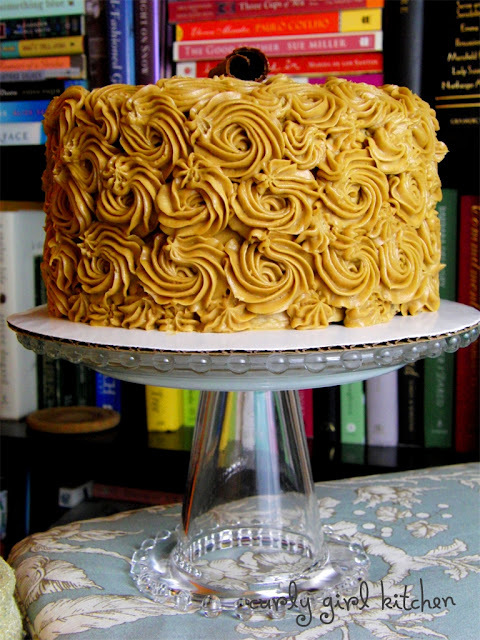 He requested a smaller cake, so I halved the recipe and baked it in three 6-inch pans, then frosted it generously with swirls of the coffee-colored buttercream. A simple chocolate curl on top was all the garnish I thought it needed. The buttercream on its own is divine, and I keep thinking of other recipes, especially cupcakes, I would like to try it on. After swirling it over the cake, the heady aroma of coffee and rum filled the kitchen. Just breathing in the intoxicating scent of this cake will warm you up on even the coldest of nights. Preheat the oven to 350; spray a bundt or three 8-inch cake pans thoroughly with non-stick spray. If using cake pans, line the bottoms with parchment paper and spray the paper, too. In the bowl of your stand mixer fitted with the paddle attachment, beat the butter and brown sugar for 3 minutes. Beat in the eggs, then the vanilla, scraping the bowl down and beating well to combine. In a separate bowl, combine the flour, cocoa powder, baking powder, baking soda and salt. In another bowl, whisk together the sour cream and rum. With the mixer on low, add the dry ingredients in three additions, alternating with the milk/sour cream, starting and ending with the dry, stirring just until moistened. Dissolve the espresso powder in the boiling water and gently stir into the batter. Pour batter into the pan; bake for 50-60 minutes for a bundt pan or 25-30 minutes for cake layers, until a skewer comes out clean. Cool in the pan for 15 minutes, then turn out onto a wire rack; cover loosely with a clean kitchen towel and cool completely. When the cake is cool, whisk together the ingredients until smooth, adding enough warm milk or more powdered sugar to achieve the desired consistency. Set the cake on a serving plate and pour the glaze over the cake, letting it run down the sides. The glaze will set in about 15 minutes. 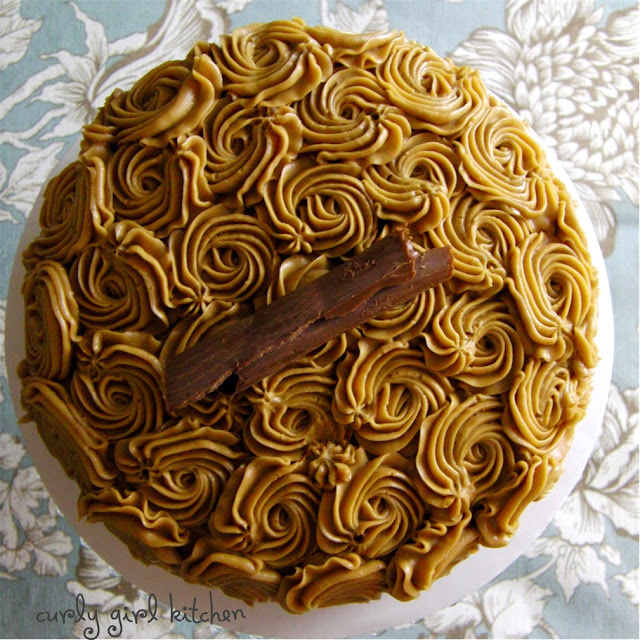 Combine buttercream ingredients on low speed, then whip on medium high speed with whisk attachment until very light and fluffy. 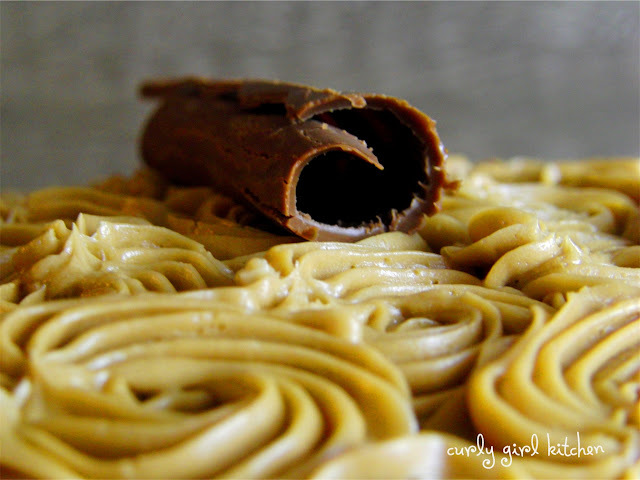 Pipe or spread onto cooled cake. What amazing experiences you had in China! And that cake looks just gorgeous. I could almost taste it as I read the recipe. I hope to make it soon!! What a stunning cake! Looks amazing. Hi! saw this cake on Daily Buzz and just have to come in for a closer look! Beautiful! Your cake is stunning! I love what you've done with the icing and the flavors. This sounds delicious!